The mining process, from the first exploration to the establishment of a mine, is both time demanding and expensive. Cecilia Lund, PhD at Luleå University of Technology has in her thesis “Mineralogical, chemical and textural characterisation of the Malmberget (Sweden) iron ore deposit for a geometallurgical model” developed a model that would shorten the process considerably. The demand for commodities has never been greater and the mineral resources are very limited. Today, the ore deposits that are large, rich and easy to mine are already exploited. The next generations mine that will provide the industry with metals must rely on ore deposits that are both lower in grade and size. 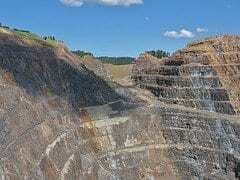 Lower mineral grades may also mean that the deposit is more geological complex. – The mining process, from the very first exploration to the establishment of a mine does have a time horizon of several years which also means high investment costs. The establishment of a mine also contribute to a significant impact on both the environment and the surrounding society, says Cecilia Lund. It is therefore an urgent need to develop and create realistic models for simulating different mining and mineral processing scenarios as early as during the exploration stage. This means that new types of mineralogical tools and analytical methods must be developed to generate the necessary amount of geological information. -The requirements for ore characterisation methods like this, is that the methods need to be inexpensive, fast in terms of producing large number samples and above all, to be a practical tool for implementation in the process. This information should be available already during the logging of exploration drill core, says Cecilia Lund. Cecilia Lund’s research describes how traditional science can be joined together and applied in the industry. This is the first doctoral thesis in the subject of geometallurgy which is a rather broad concept. -The main difference when I have developed a method like this is that I take the geological compositions in account and includes geological parameters such as mineral textures which are not used earlier. To solely use mineral grades are quite well known, says Cecilia Lund. The result can then be used to make useful metallurgical predictions in production planning and management. April 17, 2019 - Power Ore completes revised Opemiska geological model MINING.comThe Opemiska complex lies within the Abitibi Greenstone Belt and Quebec's Plan Nord lands. April 15, 2019 - Guyana Goldfields Inc. Announces First Quarter 2019 Operating Results and Comments on Potential Mine Plan Optimization Junior Mining NetworkFirst Quarter 2019 Summary. Gold production of 36,600 ounces, on track to achieve the previously stated 2019 guidance range of 145,000 to 160,000 ounces.